Built-in dishwasher removal. What an inconvenient and somewhat confusing job. It’s just another disappointment and one that comes with a substantial expense. But, you can cut down on the cost by going the DIY route. Of course, you’ll need a few tools and a bit of handyman skill. And, you can install it yourself. First, though, you’ve got to uninstall the old unit and that’s one of the most difficult parts about the process. 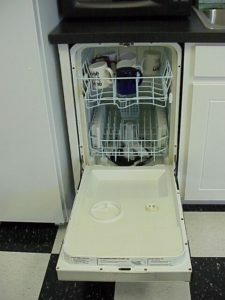 Now, before you begin to take the old built-in dishwasher removal out, you’ll first need a plan for how to dispose of the used unit. Chances are excellent you’re replacing it because it’s not working properly any longer. If this is the case, you can just call a junk hauling service who offers appliance removal. This way, you don’t have to fool with it and worry about how to properly dispose of it. Don’t make the mistake of dragging out to the curb because the local trash collection agency won’t pick it up. And, do not give into the temptation to drop it off on a vacant lot or in the back of a retail center. You’re risking a fine for illegal dumping and that’s just too much. So, get rid of it the right way. Disconnect the power and water supplies. The very first thing you need to do is to disconnect the power supply (or shut it off at the breaker on the main electrical panel) and also disconnect or turn off the water supply. Disconnect the drain line from the appliance. Next, you’ll need to disconnect the drain line running from the unit. Be sure to have a bucket and towels ready to go so you aren’t taken by surprise. Determine how it’s installed under the counter. Most built-in dishwasher units are fastened to the underside of the countertop. Take a look to determine how it’s installed so you can unfasten it. Unfasten it and gently remove it from the space. Once it’s free, you’ll need to walk it out of the space. It’s best to have a helping hand around for this to make it easier. If you need appliance removal and disposal, go ahead and phone 800-433-1094 or visit Junk Garbage Removal.